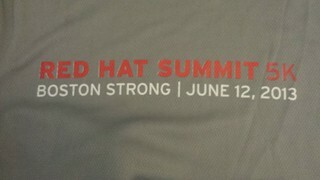 Last week I attended the Red Hat Summit in Boston. It was, for me, equal parts pep rally and intensive OpenStack training. Jim Whitehurst’s keynote was just great, because it reemphasized how much RedHat really *gets* Open Source, at all levels of the organization. So, this part was pep rally for me, and confirmed to me that RedHat is the place where I want to be. Same for Paul Cormier’s keynote. Both of these are well worth watching if you care about cloud computing, IaaS, or PaaS, or expect to at any time in the near future. I attended a number of sessions about OpenStack, and you can see a wrapup of all of that content in Perry’s blog post about the conference. And I helped out at the RDO table in the Developers Lounge. In the process I met many of the engineers that I’ll be working with, and I learned quite a bit about RDO and OpenStack, as well as who I need to go to when there’s something I don’t know yet. And I got to play around some with TryStack, a free service where you can experiment with an RDO installation, launch virtual machines, and connect in to them to see how RDO behaves. There’s a huge amount of interest in OpenStack, and the ecosystem around it is full of really cool stuff. I was particularly interested in OpenShift, with which you can launch a non-trivial webapp in just minutes minutes. Very cool stuff. Another high point of the week was the RedHat Summit 5K. There were a few hundred people in the race, which wasn’t a traditional road race, in the sense that there wasn’t any official time keeper, and traffic wasn’t stopped. We had pace groups (I ran with the 8:30 minute group), and a pacer who knew the route. I had set a goal of breaking 27, and I ran a 25:32, with which I was very pleased. This was the first 5k I’ve run since, I believe, 1994, so, not too shabby.